Known as Torr by the people who live on the N side of Lough Macnean (Kay Muhr). The name Thorne Mountains, which appears on several 16th and 17th century maps of Ireland, Connacht and Ulster, would seem to have some connection with Thur Mountain. Thur Mountain is the 759th highest place in Ireland. Thur Mountain is the second most easterly summit in the Dartry Mountains area. Thur and its near neighbour, Doagh, lie to the north of Glenfarne village in northwest Leitrim. The map suggested a road or track ascending from the sw, and it proved to have a surprisingly good surface before our progress was barred by a gate, just after a hair-pin bend at G971394 A. This track took much of the donkey work out of the walk, as we were now at the 320m contour. Climbing over the gate, we continued along the track for about 10 minutes, but there seems to be little advantage in doing so, as it merely contours the hillside without gaining you much height. We struck out NE across snow-covered heather, aiming for the summit's distinctive knoll. 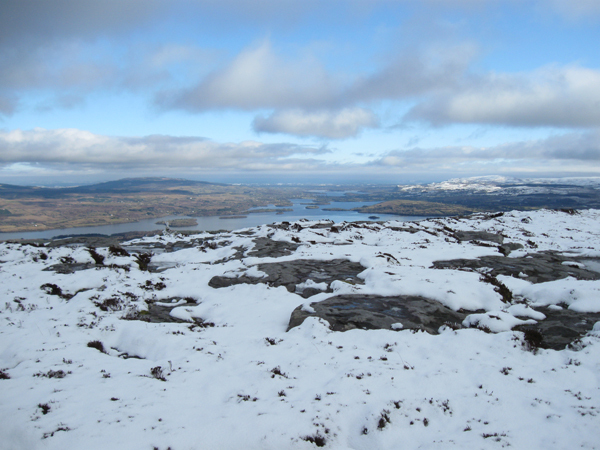 Thur's stone-slabbed and heathery summit has good views, particularly east to Lough MacNean. The vast plateau of moorland to the south of Glenfarne looked worthy of exploration, but near-neighbour Doagh somewhat fails the beauty test. Returning to the start by the same route took a little over an hour. Curiously, as we were taking off our boots at the car, a vehicle came up the hill towards us, did a u-turn, and headed straight back down. It was one of those Google cars that are taking shots of every road in the country (and ultimately, the world) for their Google Maps website.